You can also use the constructor of Long class which accepts a String and returns a Long object, but internally it also uses parseLong() method. 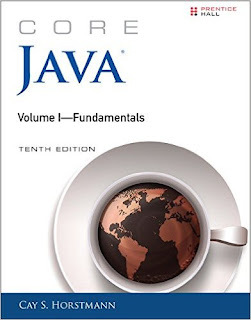 BTW, if you have just started learning Java or looking forward to learning Java from scratch, I suggest you take a look at Cay S. Horstmann's Core Java Volume 1, 9th Edition book. You will learn most of Java fundamentals in quick time. 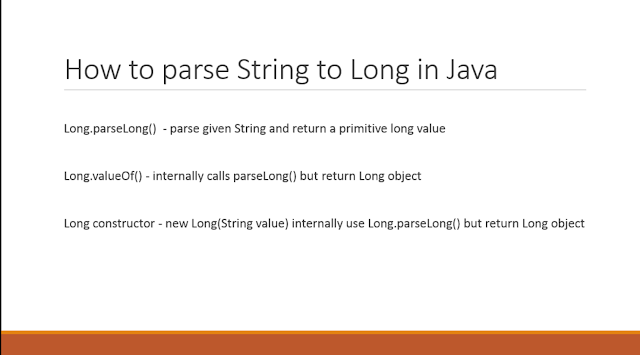 There are three main ways to convert a numeric String to Long in Java, though internally all of them uses parseLong() method to parse numeric String to Long value. Minor difference between parseLong() and valueOf() method is that former return a primitive long value while later return a Long object. Since Long.valueOf() is also used in autoboxing to convert primitive long to Long object, it also maintains a cache of Long object from -128 to 127. So it returns the same Long object for every call in this range. This is OK because Long is Immutable in Java, but it can create subtle bugs if you compare auto-boxed values using the == operator in Java, as seen in this article. You can also check Cay S. Horstmann's Core Java Volume 1 - Fundamentals to learn more about how to convert one data type to another in Java. Here is our sample Java program to parse String to long values. In this example, I have used different long values to demonstrate how parseLong() method works e.g. a simple long value, a long value with plus sign, a long value with minus sign and a huge long value which is out of range. Our program will throw NumberFormatException for that value and that's why it is commented in source code. You can un-comment and run this program to see how it behaves. From output you can see that converted long values are same as original String, which means our program is working properly. Since this method is also used in auto-boxing, you should never compare auto-boxed numeric values using == operator in Java. 3) The real method, parseLong() which does all the work of parsing throws NumberFormatException for invalid inputs e.g. null values, empty values, lonely plus or minus sign, alphanumeric String and String with out of range long values. That's all about how to convert String to long in Java. 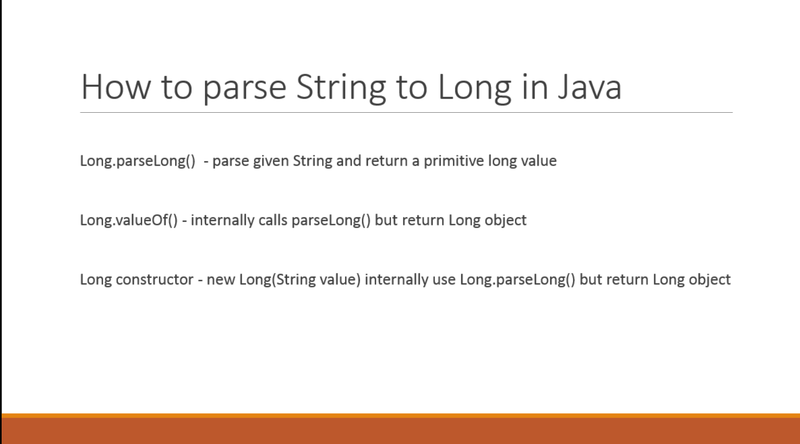 You should use Long.valueOf() method to parse String, if you need a Long object and use parseLong() method if you want to convert String to primitive long value. Long.valueOf() method also provides caching in range of -128 to 127. By the way, since we have auto-boxing in Java, which also used Long.valueOf() method, It's always better to use parseLong() method because it's readable, reveals the real intention, handles invalid input and specifically designed to parse String literal containing long values. @Andres, that's true. thanks for pointing out. P.S. I had used Java 7 to run this program in Eclipse.